Most people who placed early orders for the Apple Watch in the U.S. and expected to receive it during the first batch of shipments found themselves out of luck. Just 22 percent of the watches that were pre-ordered were shipped over the weekend, according to online shopping research firm Slice Intelligence. That’s about 376,000 watches out of the 1.7 million that were pre-ordered in the U.S., according to Slice’s estimates. Slice’s shipment figures are based on the emails received by 10,744 Apple Watch buyers. In a separate study, Slice estimated that Apple sold around 1 million watches just on April 1, the first day people could try on and pre-order the device in Apple stores and a few luxury retailers. The pre-order period ran from April 10 to April 24, the day when the watch would be available for purchase in Apple’s stores. Watches that were ordered during that time frame would start shipping on April 24. People who ordered the watch early were expecting to receive it on that day. However, strong demand and limited supplies forced Apple to change that timeline. Robust advanced order sales created a shipment backlog, so Apple told some customers they wouldn’t receive their watches until May or June. According to Slice, 547,000 more watches will ship between April 27 and June 11. Of those orders, 33 percent will get delivered in April, 28 percent in May and 1 percent in June. However, 38 percent of the orders, which translates into 647,000 watches, have yet to receive a shipment date, Slice said. People who were planning on waiting until they could buy the watch in an Apple store are out of luck. A week before the device was set to go on sale in stores, Apple’s head of retail, Angela Ahrendts, said the wearable would not be available for in-store purchase until at least June. 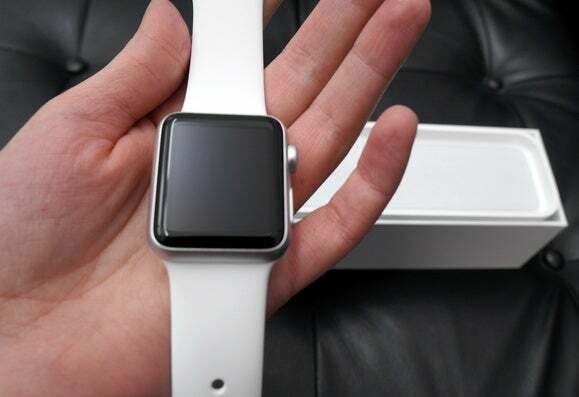 Until then, the watch can only be ordered from Apple’s website or its stores and shipped to customers.